You flag me down and tell me that there’s a hair in your food. It’s amazing the likeness it has to those blonde, curly hairs, on your head. But you’re right, it must’ve fallen off of the bald or black haired cooks we have in the back. This is another classic move to try and get something comped off of the bill. It always amazes me when the hair is exactly the same as the hair on your head. *Comped = Compensated; Free of charge: Beth the customer, had her dessert comped off of her bill after she complained that her food was cold, even though she let it sit on the table for 20 minutes while she talked her friends ears off about why she can’t seem to get any guys to date her. Talk about loserville. I can imagine (but can’t believe) people would do this – especially when their hair colour/type is exactly as the one being complained. Did you here about the McDonald’s Mom who ordered a chicken nugget and what she got was part of a chicken head??? Now that’s not a comp that’s a lawsuit. But how’d it really get there. I got a hair in my salad once at Outback but guess what I ate the salad anyway. Why? Because I didn’t want anyone spitting in my new salad!! I have a hard time enjoying my food once I know that there has been something foreign in it. I don’t think anyone would ever spit in your food for sending it back. Especially if you come off as a nice person. I haven’t heard about the chicken head nuggets. That sounds like someone wanted to peck a fight with her. Get it? Peck? Muahahaha….Sorry. Whoa. A roach is definately worse than a hair and you shouldve had that thing comped off right away! I just ate at the melting pot the other day. I really hope that was a candied nut that was in my salad. HAHA! I can’t believe some people can be so ignorant! I once found a hair, longer than the closed-cropped hair myself and my dining companion had on our heads, inside my sandwich at a reasonably nice restaurant. When I pointed it out to the waiter he said (this is an exact quote): “Would you like me to pick it off for you?” Needless to say, I didn’t eat the rest of that sandwich, or ever return to that establishment. I’m sure there are fakers out there (I’ve never worked in food service) but sometimes things really get into food that don’t belong there, and that is not the right response. Your Blog is like a cable comedy special. Very entertaining. I honestly don’t get the outrage about finding a hair (and I mean one hair, a handful would be another matter altogether) in your food. in a GOOD restaurant, humans cook your food. If your restaurant likes to cook fresh and not canned or reheated, it is only logical that humans spend a lot of time preparing your food. The longer humans spend in front of your food, the greater the chances of a hair falling in it. Wonder why you almost never find a hair in your McDonalds burger? because most of the stuff is frozen, canned or pre-cooked. 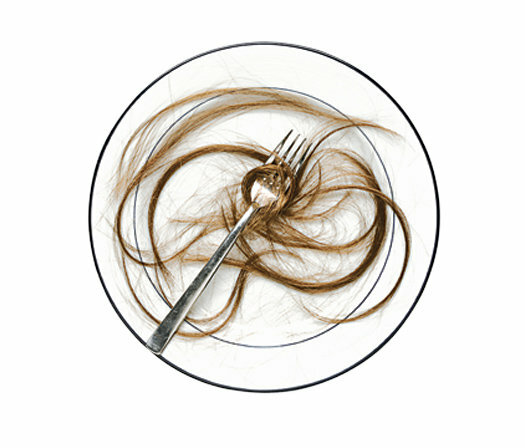 If I find a hair in my food at a good eatery, I just take it out, no big deal. Your food is cooked by humans, humans have hair, s#!t happens, end of discussion.